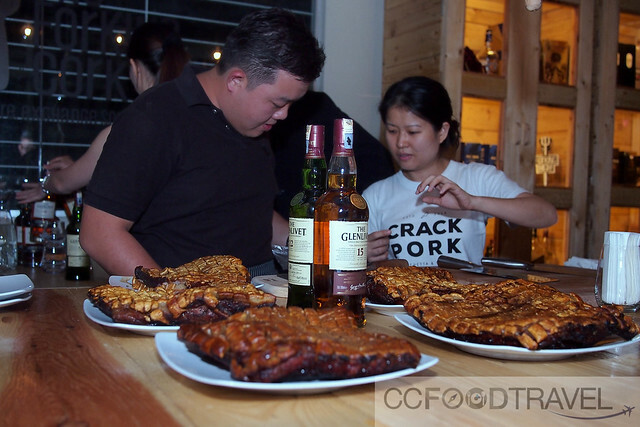 Twas a Roast Pork showdown at The Forking Cork last week. Two roasts compete to see, which would pair best with the single malt whisky, Glenlivet..
Another one of those incredibly cool, secret society events that I find hard to resist or say no to, when the invitation arrives, summoning the presence of the ‘Guardians of Glenlivet’. Makes me feel like I am part of some secret knight’s service or something (which it is, actually). Anyway, one balmy evening last week, the Guardians gathered at this cosy bar restaurant called the Forking Cork (what a name) and after a brief intro, the food whisky pairing began. 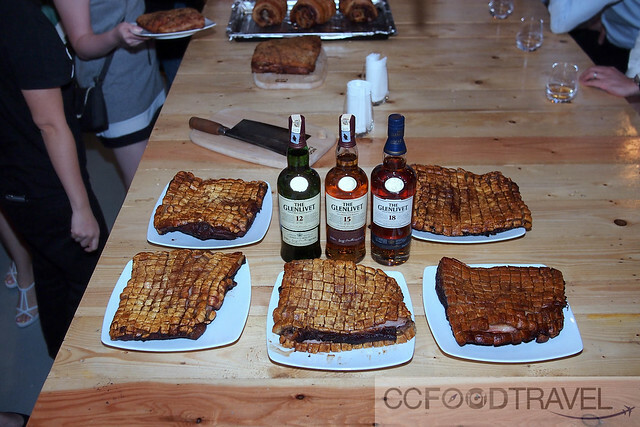 We were supposed to sample Roasted Pork from different chefs, and then decide by casting our votes, on the best whisky and food pair. With the legendary dram, you ask..?? Well it was a close fight.. 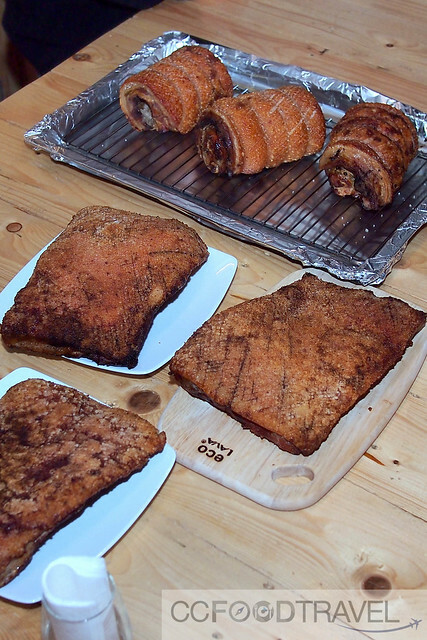 Between 2 types of Roasted Pork (Siew Yoke) and one Porchetta ..
On the left, Siew Yoke from Boon’s Signature Recipe. On the right, girls from Crack Pork (love the name!) with their Siew Yoke and Porchetta. 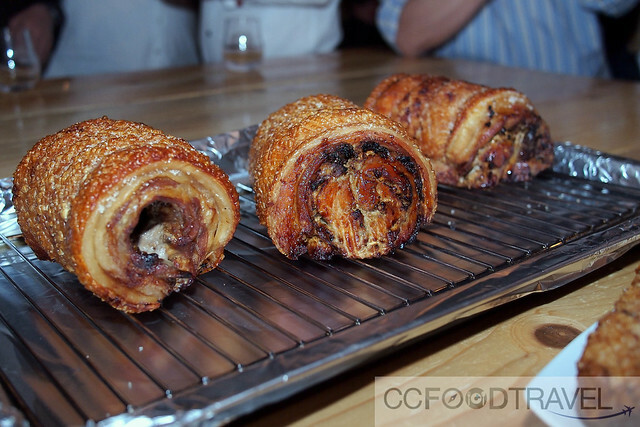 What a gorgeous specimen of porchetta! We all had our favourite Roast Pork by the end of the night.. and more importantly, they were ALL equally fabulous versions of these classics. Pair that with a whisky such as the Glenlivet, 12, 15 or 18 years.. and you have a recipe for success. Of course the entry-level of the illustrious Glenlivet distillery, the 12 years was the archetypal Speyside dram – honey and orchard fruit driven. The 15-year-old additionally aged for 3 years in virgin French oak was deeper, spicier and more complexed, but I loved the Siew Yoke pairing with the Glenlivet 18 best – full and rich on the palate with notes of honey and tannic oak.. followed by a long dry finish was definitely the best food whisky pair for me. I think in the end.. Boon’s won … but seriously you need to try both chef’s siew yoke for yourselves .. because I was hard pressed to find a winner myself! Boon’s Signature Recipe: 63-G, Jalan PJU 5/21, Kota Damansara. Next articleShould you buy the Sony DSC-RX100 IV? 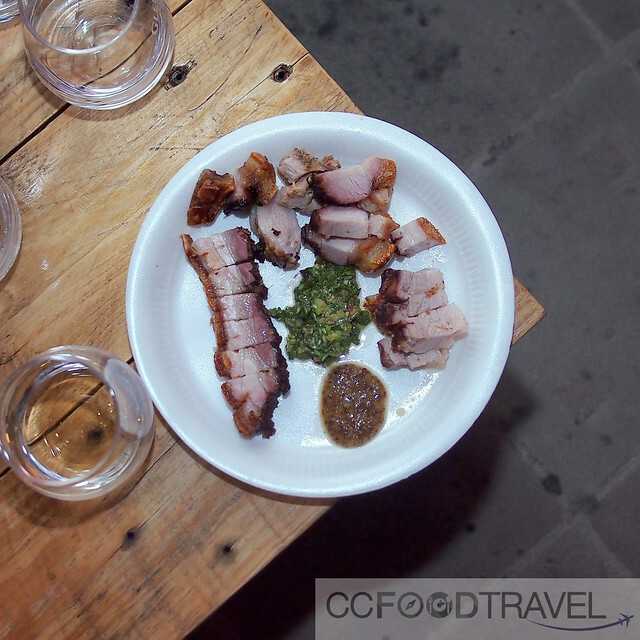 Wow, I would totally be all over this type of event, crispy porchetta and Glen Livet, sign me up! Tell me about it! Totally rawks man. The roast pork looks absolutely divine! Saw this place in another blog – thought it would be nice if they had named it Fork n’ Cork instead. My two cents’.